Man I get angry at myself. I am always neglecting to get a good "before" photo. This dresser was dropped off with a request that it be painted off white in a shabby chic style. The dresser was in very poor condition; someone had used a belt sander; naughty, naughty. 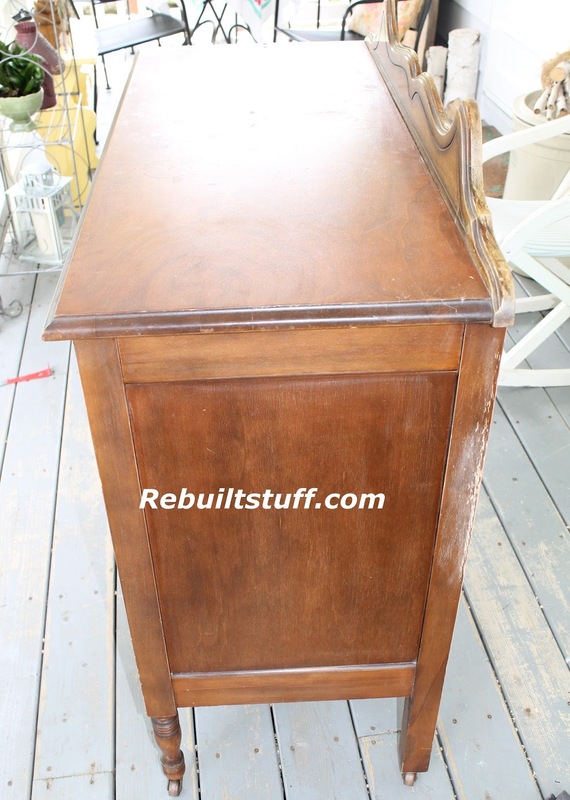 I like to restore the top to the natural wood, but the client wanted an all white finish. All for the better, as the natural wood top would have accented the uneven sanding. Belt sanding can do so much damage unless you are REALLY experienced and the grit is very fine (400) and the wood is very hard. Nothing that some glue and clamping won't fix. The drawers had to be glued together and existing hardware holes filled. Dan made a new drawer slide for the bottom along with drawer guides. This poor dresser had really seen better days. I was very nervous about how she would work out. I went with hardware close to the colour of the dresser. The flat grey hardward provided looked a bit harsh against the warm white. There is no other dark colour on the piece to use as a contrast. 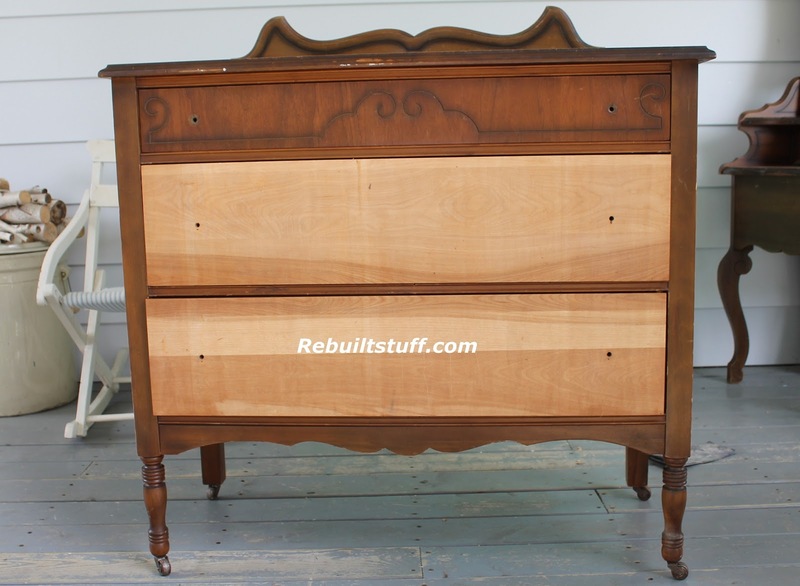 I was lucky enough to happen upon this Knechtel dresser. When you see anything made by Knechtel you are pretty sure of the quality and workmanship. At sometime in the life of this dresser, it had a cat as a room mate. I always sand prior to painting and sand between coats. I final coat all my furniture with satin varathane for a smooth finish and that added protection. The dresser is 40 inches wide, 18 inches deep and 73 inches at the tallest point. The mirror has etched detailing at the top. It has a few "age spots" but they only add to the character of this vintage piece. This commission is a home made cupboard. When the client dropped it off, I really wasn't that impressed with it. I wasn't sure it was anything I would have picked up for myself. The doors are very rough; you can tell someone used a chisel to make them. I was starting to really like it...has lots of personality. I suspect that at one time this cupboard had been heavily waxed. The paint would not stick! I REALLY had to sand off the old finish. It is made of pine or fir so it is pretty soft wood for sanding. I kept the original hinges, but spray painted them to match the drawer hardware. The cupboard looks great. I hope the owner is as happy with the results as I am.